There are some people who just love certain movies. They queue all night to be the first to get into the theater, they buy all the merchandise to do with the movie and then there are some people who get Robert Pattinson, Kristen Stewart and Taylor Lautner tattooed on their back. Oh no wait that was just Cathy Ward, from Reading, Britain who is obsessed with "The Twilight Saga". In fact in the image, which takes up her whole back Pattinson is featured three times, Stewart twice and Lautner only once. 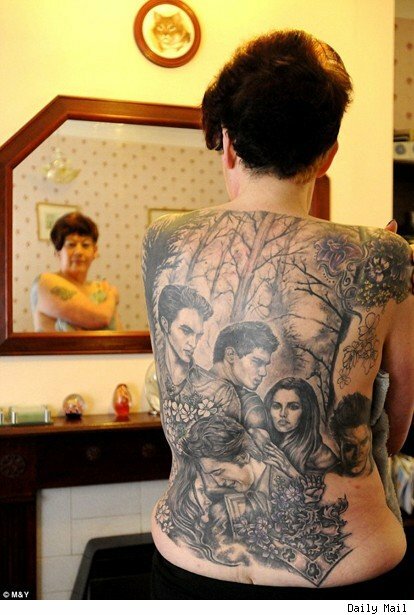 The 49-year-old decided to get the painful and permanent art work on her back after "The Twilight Saga" helped her to drop 14 dress sized. The supermarket worker swapped eating for watching the "Twilight" movies. Speaking to the Daily Mail newspaper she said "A friend of mine got me the first film on DVD because I was feeling low...Once I started I just couldn't stop myself. I had to go out and buy all the books and films. I got hooked. It became my way of rewarding myself. I wanted a permanent reminder of the amazing series so I got a small tattoo and that turned into what I have got now." I wonder how the three cast members feel about being tattooed all over back. However, it's Ward's hope that she'll get a chance to show them. She explained "I have approached the fan club and I am trying to get them to let me go to the premiere of the fourth film, Breaking Dawn. That would be a dream come true."